Our EXECUTIVE CABINS opened in 2011 and 2013 and each are situated in their own private bays. They are finished beautifully with cedar siding and tongue and groove pine in the interiors. Log tables and chairs provide space for dining as well as stools at the kitchen counter. Leather sofas or armchairs offer additional seating near the wood stove. Each cabin has two spacious bedrooms and spacious decks, just a stone’s throw from the water! Perched high on a natural rock ridge this cabin captures breathtaking views, especially at sunrise. Tamarack Ridge cabin sleeps 8 in 2 bedrooms. Two washrooms and two showers available. Cabin is wood stove heated for your comfort. Cabin also features a heat/cool unit in each bedroom and main living room for added comfort. Cabin has a fully equipped kitchen. NEW 16 foot Alumacraft boats. Features include: Helix 5 Sonar GPS, boat seats, live well, electric start, flat floor, and electronic fuel injection. NEW 30hp Yamaha motors. Barbecue is available for use as well as propane deep fryer. Tucked away in its own little bay, Super Six shines all on its own. Super Six cabin sleeps 10 in 2 bedrooms. Our DELUXE CABINS are frame constructed with cedar siding and tongue and groove pine on the interior walls. Hand carved log tables and chairs are fitting for our wilderness setting. All cabins have one bathroom with flush toilet and shower. Cabins have two or three bedrooms and decks overlooking the sunset! Beautiful newly renovated cabin with the most gorgeous sunsets right from your deck, or dock. The Master Angler cabin sleeps 9 in 3 bedrooms. Cabin is wood stove heated for your comfort. Cabin also features a heat/cool unit in the main living room for added comfort. If you love being right on the water, you can’t get much closer than this! The Edgewater cabin sleeps 6 in 2 bedrooms. Cabin is wood stove heated for your comfort. At the far end of camp, at the end of the trail is perched our Hillcrest cabin. The Hillcrest cabin sleeps 6 in 2 bedrooms. Our STANDARD CABIN is log construction with new windows, roof and deck. This modest cabin is perfect for those that are intent on doing some hard fishing and just want a comfy bed at the end of the day. Cabin 5 also serves as overflow if you are booking one of the larger cabins but need some extra beds for your group. This cabin shares the centrally located washrooms (flush toilets, showers). Cozy cabin situated near the main lodge building on Sasa-Ginni-Gak Lake. The Standard cabin sleeps 4 in one room (sleeping cabin). Kitchen is in a separate building right beside it. Shared washroom and shower facility available. Cabin is propane heated for your comfort. Our OUTCAMP lakes are located on two separate lakes in a natural pristine setting. 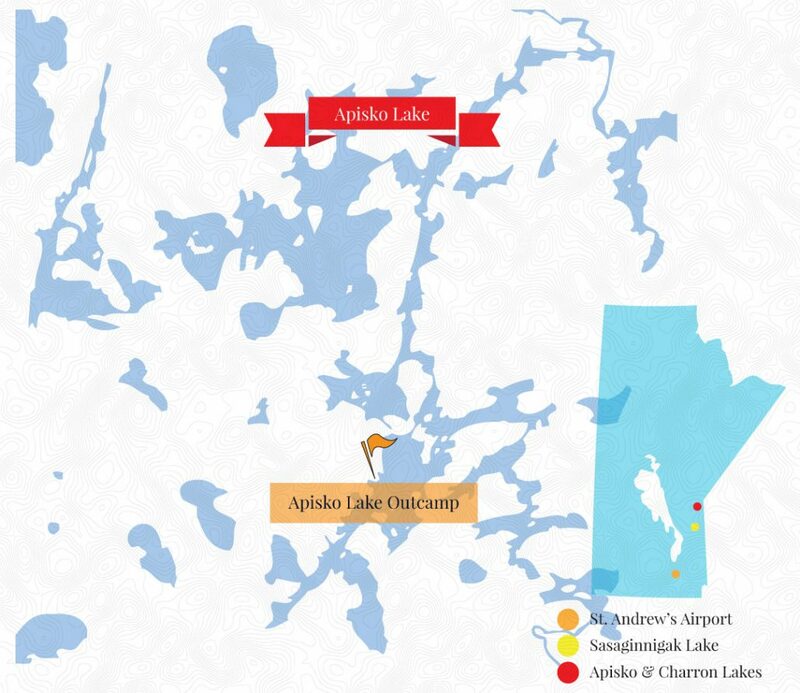 Further to the north of Sasaginnigak Lake you will find Apisko and Charron Lakes. Apisko is home to the Manitoba all time record Northern Pike of 60″, caught and released in 2004. 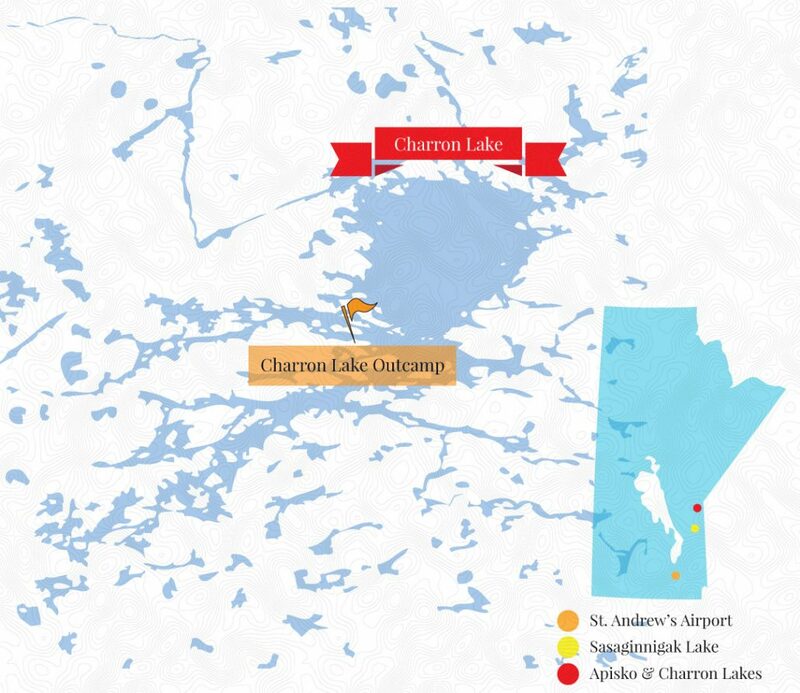 Charron is a large and deep lake with the added excitement of fishing for Lake Trout, as well as Northern Pike and Walleye. We hope you will join us for an unbelievable fishing season in the serenity and inescapable beauty of the Sasaginnigak wilderness! Situated on Apisko Lake, north of Sasa-Ginni-Gak Lake. Apisko Lake cabin sleeps 8. Apisko Lake cabin has twin beds (no bunk beds) in three separate bedrooms. *NO bedding is supplied at Outcamps. One washroom with shower facility available. NEW 16 foot Alumacraft boats. Features include: Boat seats, live well, electric start, flat floor, and electronic fuel injection. NEW 30hp Yamaha motors. Barbecue and outdoor deep fryer is available for use. Situated on Apisko Lake, a 1 hour flight from St. Andrews by amphib float plane. Apisko Outcamp is a beautiful remote lake for those groups that want to fully experience getting away from it all. You can expect to catch large Northern Pike and Walleye as this is the norm on Apisko Lake. Apisko Outcamp is outfitted with 16′ Alumicraft Yukon boats with comfortable swivel seats and flat flooring from front to back. Powering these boats are 30 HP Yamaha electric start motors all gassed up and ready to go. Situated on Charron Lake, north of Sasa-Ginni-Gak Lake. Charron Lake cabin sleeps 8. Charron Lake cabin has twin beds with some bunks. Barbecue is available as well as a propane deep fryer. Charron Lake Outcamp is a 1 hour flight from St. Andrews. This very large lake (150+ miles of shoreline) is a meteor lake with depths reaching 200 feet, and unforgettable with its crystal clear waters. This will be a fishing experience to remember! At Charron Lake you can catch Northern Pike, Walleye and Lake Trout as they are all residents in this beautiful lake. Charron Outcamp is outfitted with 16′ Alumicraft Yukon boats with comfortable swivel seats and flat flooring from front to back. Powering these boats are 30 HP Yamaha electric start motors all gassed up and ready to go.